Among explorers, hunters and fishermen, Alaska was long known perceived as a man's world. Women have often had to fight for the chance to love this harsh, beautiful land and prove they can handle its challenges. Sophie Forrester, military wife and aspiring photographer, is initially denied her chance to see Alaska when her husband is assigned to explore the Yukon Territory in 1885. But she faces her own challenges at the barracks in Vancouver, and (mild spoiler) does eventually get to see Alaska. Eowyn Ivey tells Sophie's story in her stunning second novel, To the Bright Edge of the World (Back Bay Books, $16.99). For memoirist and obituary writer Heather Lende, Alaska is home: she's spent decades living and working there. Her three books (If You Lived Here, I'd Know Your Name; Take Good Care of the Garden and the Dogs; Find the Good (Algonquin, $16.95) offer a welcome balance to Alaska's lonely wildness: the warm, colorful community of fellow residents that is necessary for survival. Kristin Knight Pace ended up in Alaska almost by accident, as a heartbroken divorcee. But her initial five-month stint turned into a decade, and now she runs a dog kennel with her husband. 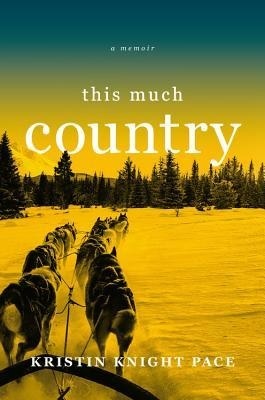 She chronicles the wonder, challenges and the grit required to complete two storied 1,000-mile dog races (the Iditarod and the Yukon Quest) in This Much Country (Grand Central Publishing, $27).